A truss is an articulated structure composed of straight members arranged and connected in such a way that they transmit primarily axial force. If all the members lie in one plane it is called a plane truss. A three-dimensional truss is called a space truss. The basic form of a truss is a triangle formed by three members joined together at their common ends forming three joints. Such a triangle is clearly rigid. Another two members connected to two of the joints with their far ends connected to form another joint forms a stable system of two triangles. If the whole structure is built up in this way it must be internally rigid. Such a truss if supported suitably will be stable. The truss has to be supported in general by three reaction components, all of which are neither parallel nor concurrent. Such a truss is called a simple truss. 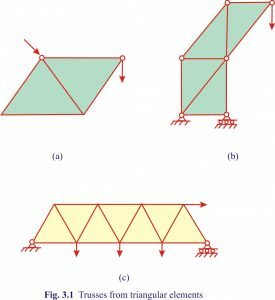 Various combinations of basic triangular elements produce general truss structures shown in Fig. 3.1. These trusses are stable and statically determinate. 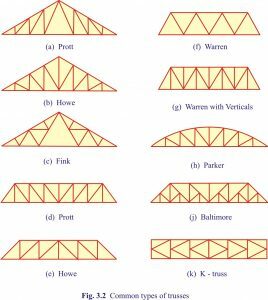 Several common types of trusses are shown in Fig. 3.2. Trusses given in Fig. 3.2a, b and c are roof trusses and are used up to 30 m span. The other type of trusses are commonly used in bridges. 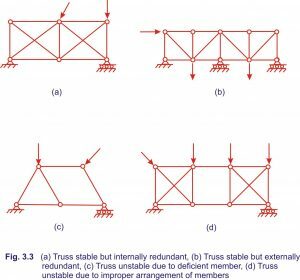 A truss which possesses just sufficient number of members or bars to maintain its stability and equilibrium under any system of forces applied at joints is called a statically determinate and stable truss. A planner truss may be thought of as a structural device having j joints in a plane. The forces that act on the joint are the member forces, the external loads and the reactions. Since all the joints are in equilibrium, we can write two equilibrium equations, and for each joint. Thus, for the entire truss we can write 2j equations. The unknowns are the member forces and the reaction components. Therefore, if the structure is statically determinate, we can write the relation. r = number of components. The following general statements can be made concerning the relation between j, m and r.
2j < m + r. There are more unknowns than the number of equilibrium equations. The structure is statically indeterminate. The degree of indeterminacy is n = m + r – 2j. Only inspection can be used to study geometric instability. The truss may be redundant either internally or externally or both. To analyses statically indeterminate trusses we need additional relationships, such as compatibility of displacements. 2j = m + r. The structure is statically determinate and the unknowns can be obtained from 2 j equations. The degree of indeterminacy n=0 ). Apart from inspection there are several ways of detecting instability. 2j > m + r. There are not enough unknowns. The structure is a mechanism and always unstable. In the light of the above statements consider the trusses in Fig. 3.3. The truss in Fig. 3.3a has six joints, eleven members and three reaction components; hence it is indeterminate by two degree. On inspection it is seen that the truss is stable but it has two additional diagonal members, one in each panel, that are redundant. The removal of these redundant members cause no instability to the truss. Thus, the truss is internally redundant by two degree. The truss in Fig. 3.3.b is stable but there is an additional roller support which is not necessary for its stability. Hence the truss is statically indeterminate by one degree and the indeterminacy is external. The truss in Fig. 3.3c is unstable. From inspection as well as from a count of members it is clear that the truss is deficient and one diagonal member is necessary to make the truss rigid and stable. Consider the truss in Fig. 3.3d. It has more members than just required. But on inspection it is clear that the end panels are made over rigid by providing diagonal members both ways and the central panel is deficient thereby making the truss unstable. It may be noted that the truss is unstable due to improper distribution of members.